Victory Decision: Raid! is a new Ultraskirmish game that allows you to command a squad sized force in the momentous conflict of World War II. Each unit in “Victory Decision: Raid!” represents one individual infantry model. Games are focused on infantry squad vs infantry squad, and a typically have 6-10 figures per side. The rules cover almost all aspects of World War II wargaming, from Troop Quality and Leadership to Bunker Assaults, Combat in Buildings and Vehicle combat. Victory Decision: Raid! features a unique Leadership-modified alternate unit activation system. The result is a fun and fast paced war game that involves both players constantly. 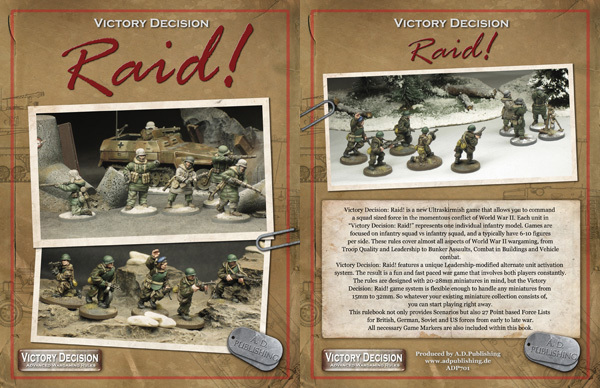 The rules are designed with 20-28mm miniatures in mind, but the Victory Decision: Raid! game system is flexible enough to handle any miniatures from 15mm to 32mm. So whatever your existing miniature collection consists of, you can start playing right away. 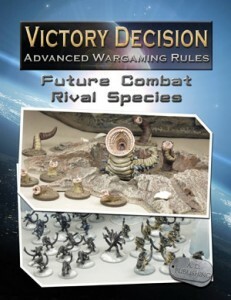 AD Publishing has released their new Victory Decision supplement entitled Rival Species. Rival Species is the first Expansion for Victory Decision: Future Combat and focusses on genetically engineered alien threats. Some alien races engineer and grow all of their technology organically. This could be due to viewing mechanical technology as blasphemy or the species could be a predatory culture with no higher goals than the propagation of their species and the destruction of any other life that could pose a threat. A Bio-Engineered force is not governed by a strict military structure in the way other races are. The group intelligence of the Bio-Engineered Aliens allows them to integrate a huge amount of hordes until their armies become immense forces, crushing any resistance that crosses its path. Rival Species brings you a complete army list, new Special Rules like an additional Overwatch Action, new Psi Powers, new Abilities and Weapon Features. 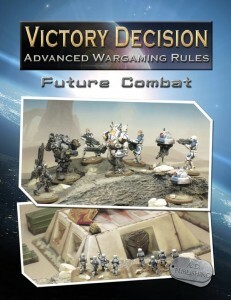 A copy of the Victory Decision: Future Combat rulebook is necessary to fully use the content of this book. As with our previous books you get a full colour version with many high quality pictures of fully painted models and a mostly B&W printer friendly version. You can get the eBook as usual via the Wargame Vault for $6.74. AD Publishing released their new supplement book. Victory Decision: Future Combat is a comprehensive game system to using SF Infantry units and Armoured Fighting Vehicles in Victory Decision. These rules cover almost all aspects of Science Fiction wargaming, from Troop Quality and Leadership to Air Strikes, Bunker Assaults, Combat in Buildings, Vehicle and VTOL combat. Victory Decision: Future Combat features a unique Leadership-modified alternate unit activation system with an integrated Electronic Warfare aspect. The result is a fun and fast paced war game that involves both players constantly. The rules cover individually based infantry miniatures and also group- or multibased miniatures, aka Infantry Stands. While designed with 20-28 mm miniatures in mind the Victory Decision game system is flexible enough to handle any miniatures from 6 mm to 32 mm. So whatever your existing miniature collection consists of, you can start playing right away. This rulebook not only provides 8 generic Scenarios but also point based Force lists that can be used to represent many classic SF settings. All necessary Game Markers are also included within this book.